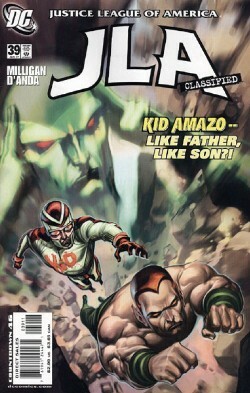 "Kid Amazo" - Part 3: "The Birth of a Tragedy!" To the detriment of his relationship with his girlfriend Frank decides that the next step in rebelling against his father is to become a super-hero. After a successful battle with a street gang known as the Bin Ladens Amazo attacks his son but doesn't kill him. To add insult to injury Sara leaves Frank after learning what he was and where he came from. Story - 4: There are times in an extended story such as this when the middle chapter can become, shall we say, boring. This has happened a lot lately and I think that has more to do with the fact that over the past seven years the five to six issue story arc has become so commonplace that a lazy writer can use that as an excuse to take a story that should last three issues at most and make it two times that long. Most people call it decompression and it's as good a term as any. Sometimes it works. Sometimes it doesn't. Now I want to make it perfectly clear that I am not calling what Peter Milligan is doing here decompression. His story is taking a natural course and is interesting enough to sustain the amount of issues it takes to tell. What I am saying is that if the story was going to start slowing down it would have done so here. This third chapter didn't do that. In fact it took the themes that Milligan began exploring back in the first chapter and took it to the next natural stage. If you are going to rebel against your Dad you become everything that the old man isn't and what better way for the son of a super villain to get at his father than to become a super hero? His fight against the Bin Ladens was fun, especially with the dialogue. Milligan also infused the inner conflict that Frank is feeling by having him want to hurt the professor he was planning to save only seconds before. So on that level this chapter not only didn't slow down but it also moved the story forward, which is growing to be a rare thing in comic books these days. So between the quality of writing and the resonance I feel with Frank in his relationship with his father and Sara this story is remaining on a solid track. It will be interesting to see the further complications and ultimate resolution to Frank's story. Art - 4: I'm still enjoying the art as well. It has been consistently good since the first chapter and I have no complaints about the work on this issue. Cover Art - 4: I believe I said it last month but Howard Porter's new style is really to my liking. I didn't like this cover as much I did last month but for my money (all US$2.99 of it) I still enjoyed what he produced this time out.